A 41-year-old man is on a prolonged VA ECMO run after a large anterior STEMI. He had a reconfiguration of the ECMO circuit to a jugular venous access cannula and a surgically created return graft onto his right subclavian artery. Since then he has been extubated (2 days ago) and has now developed hypoxia. You assess him carefully and note that pulse oximetry on the right upper limb indicates an oxygen saturation of 83%, while on the left it is 94%. Lung fields are clear on his chest x-ray. Q1. Is this differential hypoxia? Differential hypoxia (aka Harlequin Syndrome or ‘North-South’ phenomenon) is discussed in Everything ECMO 007. Briefly, this occurs in patients on peripheral VA ECMO with the combination of improved cardiac function and poor pulmonary gas exchange. In this scenario, there is a difference between the oxygen saturations of the right and left upper limbs, but there is no co-existing pulmonary dysfunction. Oxygenated blood from the ECMO circuit is returned to the patient via the subclavian artery graft so that the right upper limb is entirely supplied by blood from the ECMO circuit. 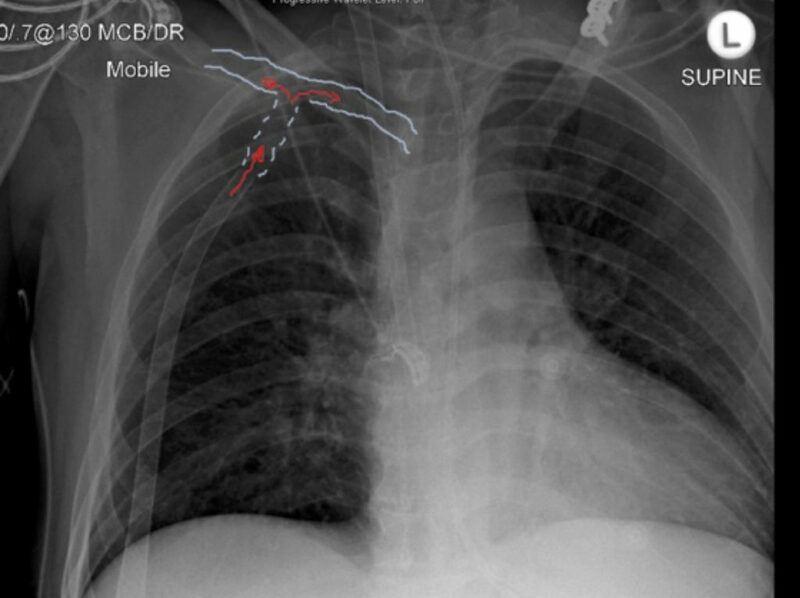 This is illustrated below, the chest x-ray shows the external return cannula with the surgical graft outlined onto the subclavian artery. Blood flow is anterograde into the right upper limb and is retrograde into the aorta. The jugular access cannula is seen with its tip just in the right atrium. Q2. What is the likely cause? In a VA ECMO patient with a subclavian artery return cannula, the most likely cause of this ‘pseudo-differential hypoxia’ is oxygenator failure. Paradoxically, this mimics the differential hypoxia that can occur in a VA ECMO patient with a femoral artery return cannula who has pulmonary dysfunction and cardiac recovery. That is, there is hypoxia in the right arm, and normal/high oxygen to the left hand and lower parts of the body. A second possibility includes ischaemia of the upper limb through obstruction of the limb component of the graft. Q3. How can you confirm your suspicion? Confirm there is adequate blood flow into the right upper limb using arterial doppler. On checking these you note that there is no appreciable colour differential between the access and return limbs of the ECMO circuit. Q4. Given the findings in Q3, what do you need to do next? The only abnormality you find on these checks is that the transmembrane pressure is 32 mmHg, which is mildly elevated given the low ECMO circuit blood flow of 2L. Q5. What is the next step and why? A timely circuit change is indicated, as the oxygenator has failed. Although there is no evidence of an oxygenator thrombus, oxygenator failure is a recognised phenomenon after 2-3 weeks of circuit life and is characterised by a gradually decreasing post oxygenator pO2. Theoretically, you could change the oxygenator in isolation, however, this is a slow, laborious task and the oxygenator is only available commercially with an entire circuit. In addition, biological material adherent to the circuit, which is a potential trigger for inflammatory and thrombotic cascades, is also removed by changing the circuit. Two days after correcting the problem you are asked to review the same patient for hypoxia once again. This time the left upper limb arterial O2 saturation is 86% compared with 100% on the right upper limb. Q6. What is the explanation for the difference in arterial O2 saturations between the left and right upper limbs? This is “true” differential hypoxia in a subclavian return configuration, we like to call this ‘reverse differential hypoxia’. 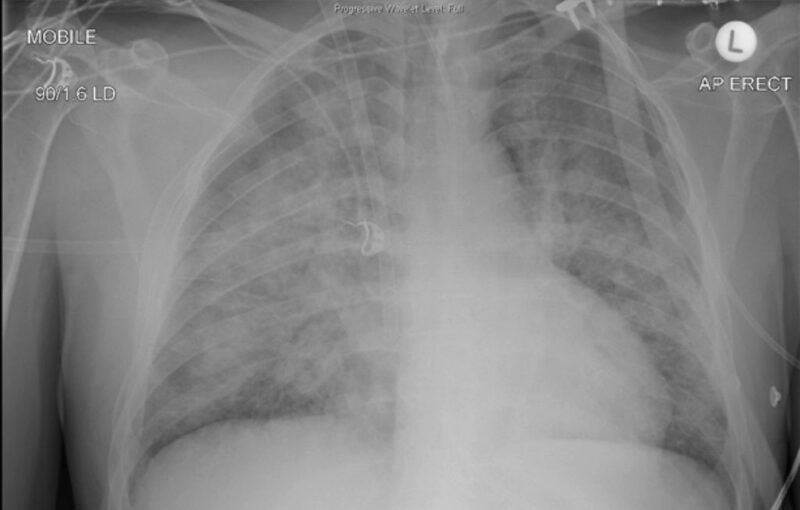 The chest x-ray demonstrates bilateral alveolar opacities consistent with pulmonary oedema, which impairs oxygenation of blood in the native circulation. Compared with the first scenario two days previously, the oxygen differential between upper limbs has reversed resulting in lower arterial oxygen saturations in the left upper limb. This has occurred because poorly oxygenated blood that has passed through the pulmonary circulation and ejected from the heart mixes with highly oxygenated blood from the ECMO circuit which enters the aorta from the right subclavian artery. Thus, in this VA ECMO configuration, pulse oximetry on the right upper limb monitors circuit function and pulse oximetry on the left upper limb monitors his respiratory function. The hypoxia in the left upper limb can be corrected by treating the pulmonary oedema (e.g. increasing FiO2, positive pressure ventilation with PEEP, fluid removal and optimising cardiac function). Low arterial oxygen saturations in the right upper limb compared to the left is usually characteristic for differential hypoxia in peripheral femoro-femoral VA ECMO. However, in a configuration where the return line connects to the right subclavian artery, arterial desaturation in the right upper limb indicates a failure of ECMO oxygenation rather than pulmonary dysfunction. Beware of ‘pseudo-differential hypoxia’! 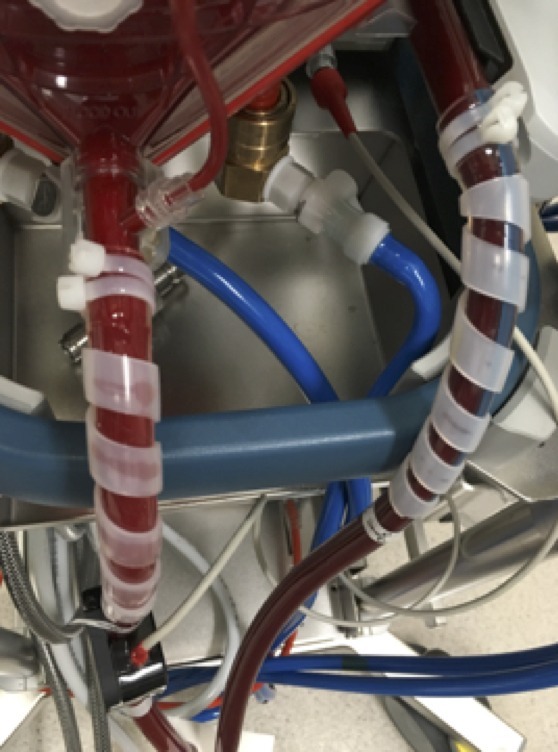 Observing for a colour differential between blood in the access and return limbs of the ECMO circuit is is a vital clue in the absence of routine post oxygenator oximetry and should be part of the rapid visual assessment of ECMO patients. Watch out! Dark red blood flows from the patient toward the oxygenator in the access limb of the ECMO circuit, whereas bright red blood – if the oxygenator is working! – leaves the oxygenator and is pumped toward the patient via the return limb of the ECMO circuit. Finally, patients with a subclavian return configuration can still get “true” differential hypoxia from pulmonary dysfunction, however it will manifest as ‘reverse differential hypoxia’. Watch out for that too!